Diversity & Inclusion has been a part of Capgemini’s core values since our inception. In North America, strengthening our diversity and promoting a more inclusive culture is a top business priority, as we recognize its ability to move us forward in a competitive, increasingly culturally and globally diverse market. Promoting diversity is morally correct, and it enhances our business activities. While many of our colleagues are familiar with our efforts in the Inclusion space, a shift is happening in that Capgemini is now positioned in many of our business communities as a thought leaders on this topic. Capgemini invests in women leadership through a four month program designed to train and mentor high performing women who are Senior Managers in the North America organization. The program provides career objective-setting and outside coaching for these high potential women, who are nominated for this training based on their current performances. Since inception, over 200 employees have completed WLDP. Employees completing this program have a 13% higher retention rate than the average retention rate for employees in NA. Capgemini US and Canada attained EDGE Certification in 2016 and 2017, respectively. EDGE stands for Economic Dividends for Gender Equality, is the leading global assessment methodology and business certifications standard for gender equality. EDGE Certification is designed to help organizations not only create an optimal workplace for women and men, but also to benefit from it. Capgemini’s U.S. business was awarded the EDGE Assess Certification, the first professional services firm in the U.S. with this distinction. Capgemini Canada has been granted the Economic Dividends for Gender Equality (EDGE) Move certification for its representation of women in leadership roles at manager and above, and the positive employee perception among men and women around fairness of pay. It is the first professional services firm in Canada to receive this designation. Gender Balance is not just about external certifications an accolades. We must review our progress against internal metrics. Refer to these highlights for hiring, retention and promotion. In 2017 H1, female hire parity is higher than male hire parity in each grade except “A”. In 2016 grades “C”, “D” and “E” had improved parity in comparison to year 2016 hire parity. Retention Parity 2017 shows much improved results in terms of parity and retention both in comparison to 2016. Improved parity in Grade “A” promotions male (2.7%) vs. female (3.2%) in 2017 (as compared to 2016) which was – male (1.3%) vs. female (4.4%). Improved parity in Grade “B” promotions male (9.8%) vs. female (8.8%) in 2016 (as compared to 2015) which was – male (6.9%) vs. female (11.5%). Improved parity in Grade “E” promotions male (12.2%) vs. female (13.7%) in 2016 (as compared to 2015) which was – male (8.4%) vs. female (16.2%). Capgemini’s Women’s Leadership Development Program (WLDP) is a six month program designed to provide training, mentoring, career objective-setting and outside coaching for high performing / high potential women Senior Managers+ in the North America organization. Select candidates are nominated based on current performance and potential. Since WLDP’s inception in 2007, 160 colleagues have completed the program. The rate of retention for WLDP participants is 2 points higher than overall NA Retention. We started our Culture, Bias and the Brain Leadership Program in 2013 with a goal to grow awareness of the business value of workplace inclusion. Program participants identify our future culture, define unconscious bias, explore specific actions required to maintain workforce engagement (for self and teams), and develop competencies that support integration activities (e.g., multicultural communication). Since inception, nearly 600 employees have completed training on unconscious bias. Employees completing unconscious bias training have a 17% higher retention rate than the average retention rate for employees in NA. Janet Pope, Unconscious Bias Session, to know more click here. Diversity Best Practices (DBP) is the preeminent organization for mid to large size organizational diversity thought leaders to share best practices and develop innovative solutions for culture change. Through research, resources, benchmarking, publications and events, Diversity Best Practices offers organizational members information and strategies on how to implement, grow, measure and create first-in-class diversity programs. In 2016 and 2017, Capgemini colleagues have attended a number of DBP Conferences and presented on the topic: Let’s Talk Talent: Examining the Talent Lifecycle through a D&I Lens and Measure the Success of ERGs. Nolan Melson’s Reflections on his DBP Award,click here to know more. Capgemini is a member of the National Diversity Council (NDC). The NDC is the first non-profit organization to bring together the private, public and non-profit sectors to discuss the many dimensions and benefits of a multicultural environment. The vision of the NDC is to cultivate a nationwide network of affiliated councils to advance diversity and inclusion by transforming work places and communities into inclusive environments where individuals are valued for their talents and empowered to reach their fullest potential. Capgemini is proud to support the National Diversity Council’s Women In Leadership Symposiums (WILS). The vision of the National Women in Leadership Symposium is to develop a network of nationwide annual events and to be the premier resource for women to be able to network, mentor and participate in professional development programs geared toward helping them rise in their careers. 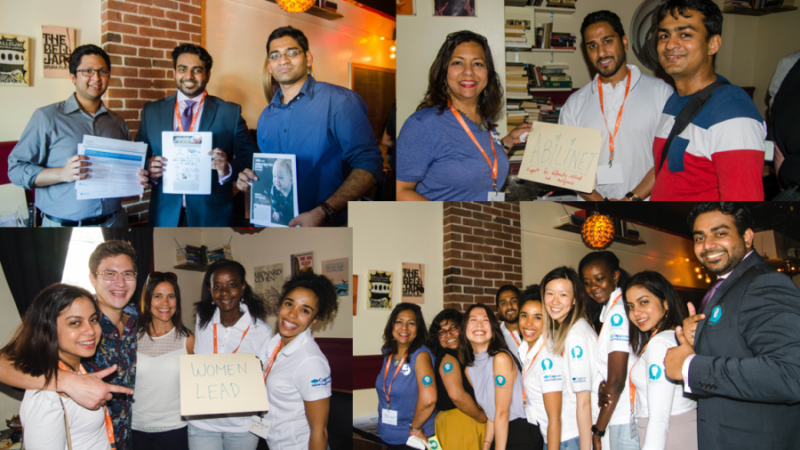 This year’s WILS theme is, “Be Fearless: Influence, Innovate and Inspire.” For H1 2017, many Capgemini NA colleagues participated in WILS in various cities throughout North America. In April 2017, Capgemini was proud to sponsor the 13th Annual Texas Diversity & Leadership Conference hosted by the National Diversity Council in Houston. This year’s conference theme is Fostering Equity through Inclusion. This three-day conference afforded organizations the opportunity to explore tools and resources necessary to build diverse workforces and remain competitive on the global stage. During the luncheon on Day 2 of the conference, Janet Pope was honored by the National Diversity Council for her Diversity & Inclusion work within Capgemini, and our community. At this year’s National Diversity Council (NDC) Houston’s Women’s Conference on September 20, the NDC presented the first ever Jana Wilson Award, sponsored by Capgemini NA. The Jana Wilson Award honors a woman leader in business or the community who is devoted to mentorship and invested in helping her colleagues (women and men) thrive in their professional pursuits. 5 women leaders were recognized this year: Amanda Beekes, Jodi Bernstein, Zandra Foley, Arquella Hargrove, Janet Pope, and Carla Wilder.